In the noisy online world, it can be extremely difficult to stand out to readers. Remember, you only have eight seconds to capture a user’s attention whether it’s on social media or your organization’s website. 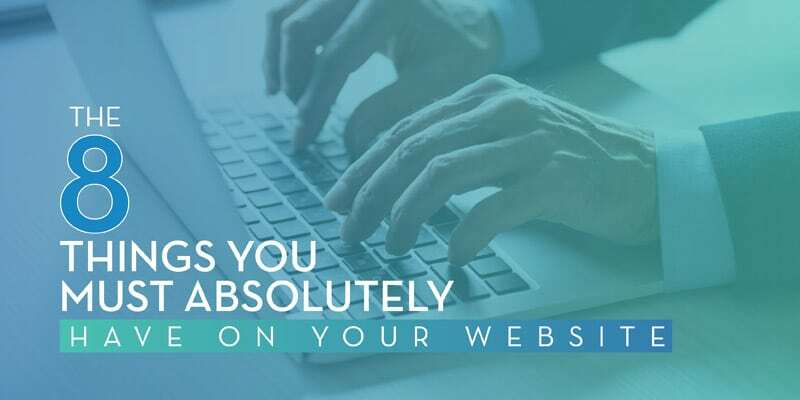 To keep readers who land on your homepage engaged and invested in your website content, here are eight things that you absolutely must have on your website. Web users have become used to an online environment filled with lots of video and engaging images. The popularity of Instagram alone has shown just how important sharing high-quality visuals with your audience can be. If your organization has the means, invest in a quality photographer to photograph your staff members at work or an an event hosted by your organization, or invest in quality stock images that can be used on both your website and social media pages. Having a library of engaging images will be valuable as your organization continues to develop new content for the website. Many marketing staff in organizations focus a lot of their energy in building social media followings and trying to get those follower and engagement numbers up to impressive levels. This focus on social is important, but as we know, the complex and ever-changing algorithms of Facebook and Instagram, and the noise volume of Twitter, mean that your message rarely reaches all of your followers. Social platforms are just not a reliable way to communicate with your donors, volunteers, event-goers, and fans. But if your organization has a newsletter signup front and center on you website where users can opt-in for emails, the continually growing email list provides a great way to stay in frequent contact. Provide engaging and valuable resources, content, and communications to your audience that emotionally connect them to your organization. 3. Links to your social media pages. Even though an email list gives you more control over communication with your audience, social media is still a necessary form of communication with your clients. While newsletters ensure your audience is hearing from you on a regular basis, social media is where you can build a community around your organization, allowing for engagement with you and with each other, as well as, potentially increasing the number of newsletter subscribers you have. Connecting like-minded individuals who are all supportive of your cause is a great way to bolster the strength of your audience and to reach a wider range of online users. And don’t bury these links in the footer! Keep them visible to the user so it’s clear you want them to join you on social. Some argue that blogs are antiquated and unnecessary in the evolving online space. While users do spend less time on webpages, a blog is still a great resource to provide for your audience. You can share important information about your organization or go more in-depth on a certain subject that may be valuable to some of your audience. With all of the content that you can create for a blog, marketing staff in your organization can also develop an SEO (search engine optimization) strategy surrounding your blog, which will help your website’s search-engine rankings. If your website is at all confusing or if your audience can’t find important information within moments of arriving on your homepage, there is a high likelihood that the user will click away from your site. Make sure your organization’s website has a well-designed navigation bar with clear page names. Work with a website designer to create a user-friendly flow from page to page that will keep your audience on the site for longer periods of time. 6. Your organization’s contact information. For the sake of transparency, in addition to accessibility, make sure to include some kind of contact information so that users can get in touch with you. A phone number that directs people to a generic voicemail or a shared email inbox where your audience can reach out to you are great ways to start if your organization can’t dedicate staff members to managing a live phone system. We’ve heard corporate donors say that they have been frustrated by websites without contact information, because they want to give the organization money but can’t find a person to talk to about it. You certainly don’t want to miss out on that kind of opportunity! 7. Don’t forget the call-to-action. Whether you want people to donate to your organization, volunteer, attend an event, join, or something else, choose the most important one and make it very clear with a bold call-to-action button on your homepage. And keep that button available on every page by including it in your navigation bar. Whenever the user makes the decision to donate, volunteer, join, or whatever you want them to do, it needs to be easy for them to take that step. It’s not the most exciting element and you can definitely bury this one in the footer, but with the new focus on privacy, and the laws recently passed by the European Union, you should protect your organization by having one on your site. It’s especially important for any organization that collects email addresses from people in California or in Europe.The Better Business Bureau has a great template that you can simply cut and paste and fill in with your specific information. BONUS! Online users are using their phones more than ever to look at your website, so your site must be mobile-friendly and compatible. Work with a web designer to ensure your organization’s website can function on a web browser and on a phone application. Whether your organization is building a website from scratch or looking to do a refresh to reflect its growth, including all of these elements in the website design will be instrumental in expanding your reach and continuing the growth of your organization.